as much as i love a fashion find, i could never say no to opening ceremony/chloe sevigny. the hardware on this style is beyond chic. I adore those booties! Great find. I have to say that the details in the Opening Ceremony piece set it 100x apart from the Dollhouse version. But if I was saving my pennies, the Dollhouse item would do. They actually look like they might be comfortable too! I think the Opening Ceremony screams way more luxe and rocker chic. Great steal find you found though! I think I actually like the Dollhouse look better! I like the dollhouse look too! I'd have to splurge and go with the Opening Ceremony. The hardware on that pair really make all the difference. Those look like the ones Rhianna wears in her rude boy video! At only a tenth of the price the Dollhouses are a great find for the thrifty shopper - but I really like the silver buckles and I prefer real leather. So I'm still saving up for a pair of the Chloe Sevigny ones. Hrmm, I like the hardware on the Opening Ceremony ones, but the price on the cheaper ones is going to get me lol :) there is something kinda 90's about these, I want to wear them with a dress, just to mix it up :) Great picks Erica! I think I would have to splurge and go with the opening ceremony ones! I love boots, so I'll go for the Dollhouse, leaving enough $$ left over for more boots. Great shoes! I would take either pair. I love them both! They're IDENTICAL to me. 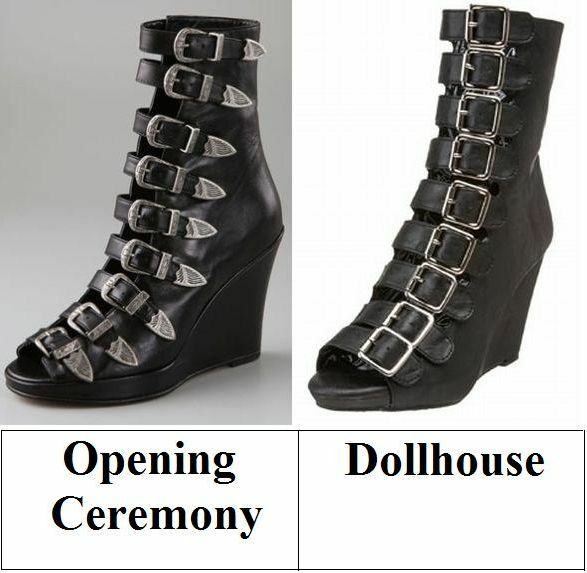 I'd definitely go for the Dollhouse boot. Mmmmm... What a great alternative! You always find the best things! I love the tightwad version. Totally cute! omg..I want some of those soo bad. I can see why the others are more expensive..but I'd grab Dollhouse right now! hmmm, i think i like the dollhouse ones! Wow, good find! Sam Edelman makes a similar pair that's sorta expensive but less than the OC's. I have to admit though that I've seen these sandals out on some girls and they don't look as great as I would have thought...oh well! YSL jacket, Missoni tank dress and RARE Liberty print Cacharel skirt for sale! The Opening ceromony ones are purely awesome. I know they're very expensive, but they are gorgeous. I love both of the shoes, I like the Dollhouse one a bit better, but that could also be the picture! Normally I'm a big spender when it comes to footwear, but those Dollhouse shoes are so amazing, I might have to be thrifty... Wonder if they carry size 11? Will have to go check! Am not keen on mock leather. I prefer the Chloe Sevigny booties. Totally awesome from Dollhouse. I just don't know how comfy they'd be..but then again..beauty must suffer sometimes. I'm a bargain babe all the way when it comes to this one! I'm not a fan of the style on either, but for the pricepoint I'd go with the Dollhouse. Not really my style, but very very cool find. I have been considering buying the Jeffrey Campbell versionof these for ages, but I am scared my mum will think they are stripper like platforms. I could NEVER pull these off, but if I was suddenly seized with the urge to buy them, I'd definitely go with the Dollhouse ones! If I ever want to shop fpr something, I'll first call u up Erika!! These are effing irresistible!! Def go for the 56 ones! there's practically no difference! I would be a tightwad on this. I can't decide which I prefer! Although I really can't see myself rocking either. Oh man! I probably wouldn't wear these shoes because they would look TOTALLY crazy on my bird legs. People would probably stop and stare at me with pity in their eyes haahahahahahaha! I would be quite a sight! But I like the silver tips on each buckle on the expensive pair... shoot! I think opening ceremony wins this round! There's something intrinsically wonderful about the hardware on there. Though those boots aren't my style, I could see how girls would go for the OC ones because of the great detailing in the hardware. That being said, if someone was just looking for a strappy, platformy peeptoe boot, the Dollhouse ones sure beat the former with that price! It's great that you do these features on your blog, Erika! Thanks for taking the time to look for deals for the rest of us. i like the left shoes..
ur link was done..check on my list..
that's such a lovely replica ! they mean alot to me !! I love a good bargain and love these looks for less! Now, these are very interesting shoes! For my personal taste they have a bit too much hardware and aren't exactly my style, however I can totally appreciate the effort and techinique that went into designing and making them. And the Dollhouse version is a really good substitue for the Opening Ceremony pair, so great job in the face-off pairing, Erika! I have wanted shoes like these for quite a while now. I am a sucker for buckles! fierce! i like the opening ceremony one more. Great boots! I'm in love! I've seen quite a few copies of this boot/wedge! Jefferey Campbell does one to doesn't he? Not as cheap though!